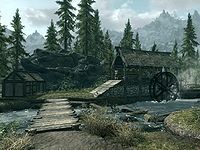 Half-Moon Mill is a lumber mill that supplies Helgen and Falkreath. It is operated by Hert and Hern, who live in a small cabin across from the mill itself. It is found on the shore of Lake Ilinalta, west of The Lady Stone, east of Hunter's Rest. 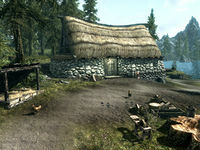 It is beside the road that leads north from Falkreath towards Rorikstead. * This person only appears once you have received a certain Dark Brotherhood quest. The property is adjacent to the road, beside a stone bridge that crosses a stream that is filled with tree trunks and branches as it joins Lake Ilinalta. Both the lake and stream split the property and are rich in salmon. The wood mill and a butcher shack are on the far side of the stream, with a wooden bridge joining them. The butcher shack contains a table holding three haunches of raw venison and two joints of raw beef. Under the table there appears to be the gory remains of a human and hanging from the ceiling is a rack holding two rabbits. The cabin is a single-story building with a chicken coop containing two chicken nests between the road and cabin. In front of the cabin, near the stream, is a tanning rack and opposite the coop are a wood chopping block and grindstone. There are several tree stumps around the property where they have been harvested by the mill. At the rear of the property is a large iron ore vein on the ground with a pickaxe stuck in the ground beside it. Near this is a dead rabbit on a tree stump. The are plenty of plants and flowers around the property. Speaking with Hert, she will instruct you to grab an axe, as she will pay you for chopping wood. The cabin itself is a single-room dwelling. Upon entry there is a chair and barrels on the left, against the southeast wall. Against the southwest wall is a cupboard holding only clutter, with more food barrels next to it, mostly containing raw meats. A long wooden table and bench along the northwest wall holds a haunch of raw venison, a joint of raw beef, a bottle of Nord mead and a bottle of alto wine, with two pine thrush eggs under the table. Hanging above the table are three garlic braids, two bunches of elves ear and a bunch of frost mirriam. To the right is a hanging rack holding three rabbits and three pheasants. To the right of the table is a kettle containing three chicken's eggs and another food barrel. In the middle of the northwest wall is a fireplace with a cooking pot in front and a kettle on the hearth containing two leeks. In front of the fireplace is a round wooden table and two chairs. On this table is a bottle of wine, one of alto wine and two pheasant breasts. To the right of the fireplace, coming out from the northwest wall is a large owned double bed, with an unlocked chest at the foot of the bed. Under the bed on the right-hand side is a copy of Physicalities of Werewolves. In the northern corner is an end table holding a bottle of Nord mead. Against the southeast wall is a wardrobe and dresser, both containing common clothes, with a food barrel between them. 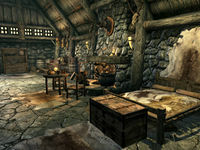 You can buy sawn logsHF here after installing Hearthfire by speaking to Hert. You can also cut your own for free if she has given permission to do so. When building a home with the Hearthfire add-on, your map marker may send you here to buy sawn logs. If Hert is dead, you may simply go to another wood mill to purchase lumber to clear the objective. Just a little ways to the northwest is a cairn with a dead Dark Elf that looks very white as if drained of his blood, another possible clue to their true nature. If Dawnguard is installed, both Hert and Hern appear with the glowing red eyes typical of vampires as well.